On September 2003 Dr. Donny Hamilton, President of INA, and I visited the shipwreck site and started the preparation of the logistics of the excavation of the Playa Damas shipwreck. 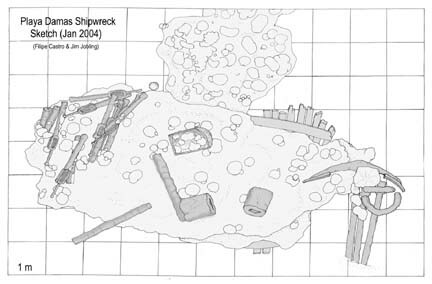 The shipwreck lay at a depth of about 4.5 m (15 ft.) and the site consists of a ballast pile with an area of about 60 m2, roughly 10 by 6 meters, with three large anchors and an large number of iron guns, at least 12. 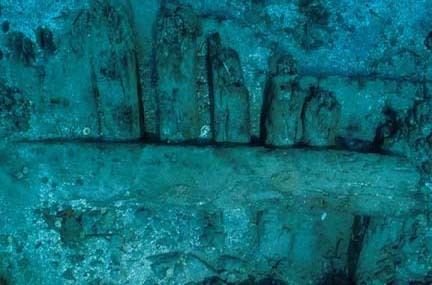 An extensive portion of the hull lies protected under the ballast pile. The planking is 6 cm thick, frames are 17 to 18 cm square in section, and stringers are 27 x 7 cm. The scantlings, number of guns, and size of the anchors indicate a ship larger than the 50 ton Vizcaína. In order to verify the early 16th-Century date obtained by Spiegel another sample of timber - this time from an oak futtock - was taken and dated. This sample produced a radiocarbon date of 1530-1550. This date is compatible with the previous one, since hull planks were traditionally cut from much larger trees than futtocks and the sample from the planking may have corresponded to an inner portion of the tree. Reutilization of timber cannot be excluded as another explanation for the early dating of the planking sample. Two wood samples from the hull were run by two different laboratories and both confirmed the early dates. We are still waiting for the dating results from the futtock sample that is being run. Radiocarbon dates from the organic lining of an olive jar fragment yielded a compatible date of 1450-1530.